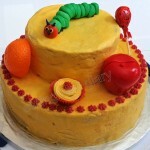 What’s special about this cake? 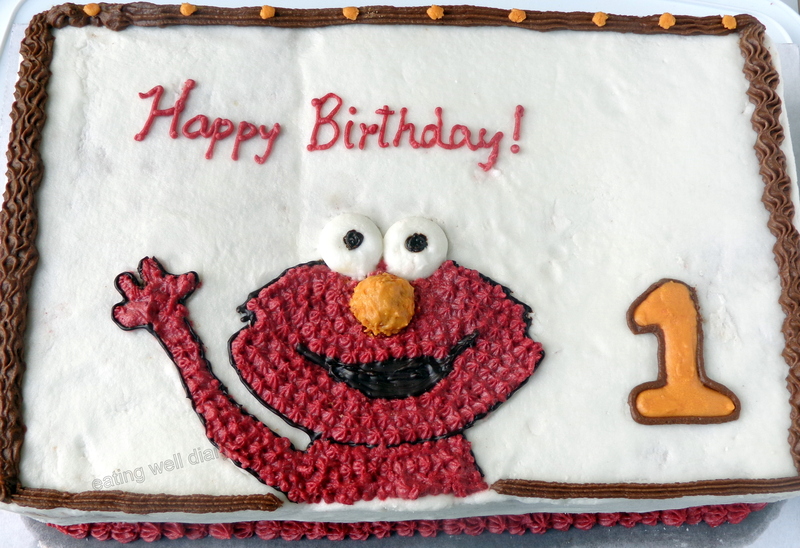 Not just that it is for a cute little munchkin, a friend’s kid who loves Elmo. This is my first vanilla-flavored birthday cake. 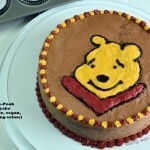 I was able to decorate it with no synthetic food colors, just homemade plant-based colors! Using natural colors was not a criterion, but I wanted to see if it could be worked out. My friend only wanted a non-chocolate cake, and so I took this opportunity to optimize a recipe for a basic vanilla whole wheat cake. Till yesterday, I did not think it was possible to get a bright red color in frosting. Tried boiled cranberries, but it did not work. I have used natural pink color from beets before, and read on the internet that it can make red too. It was time to test that! I juiced a beet and reduced the juice by boiling, and voila! There it was, a nice red frosting with the humble beet. What about Elmo’s orange color nose? Surely carrots would work, wouldn’t they? Yes, they did. 🙂 And they both taste delicious! This white cake can be easily made vegan by substituting regular yogurt with soy yogurt. Folks at Fiesta Friday #41 party, there’s one more cake that we can party with, as guilt-free as I could make it. Hope Angie and co-hosts Nancy and Loretta like it as much as we do! baking powder- 1 1/2 tsp. * Combine dry ingredients in a bowl. * Mix wet ingredients in another bowl, add dry to wet in portions. * Bake at 350 °F for 35 minutes or till a knife inserted in the middle comes clean. powdered sugar- about 2 lb. thank you, Indu. Yes, all the kids liked it! This looks absolutely amazing! Well done! thanks, Nell. Glad you like it! Very happy that you like it, Chitra! Love that you make it all natural and healthy! I did rack my brains in the experiments, but I’m glad it worked out! thank you so much for your generous words, Nancy. You’re a great co-host for our party! Wow! Clever and creative you!! It seems you were out to just use plant based ingredients and you were very very successful. 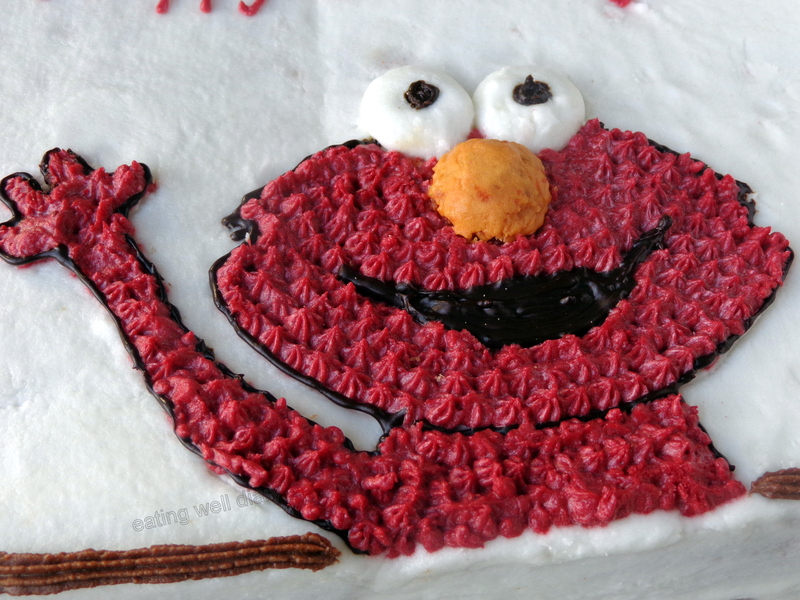 Love Elmo, you did such a super job. Bravo! So cute!! I love Elmo, by the way. 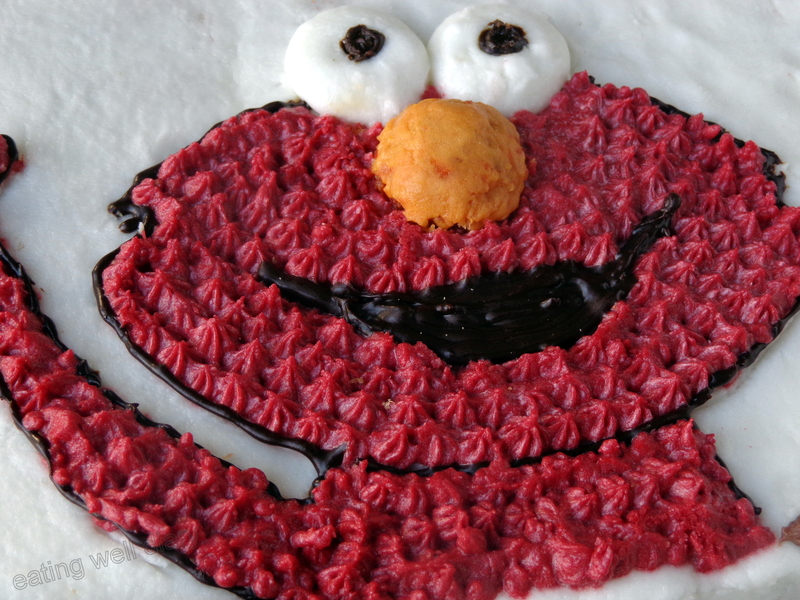 I made Elmo cupcakes for my daughter’s 2nd birthday- lots of candy for the decorations- and red food coloring. You did such an impressive job getting a perfect red without it! Yes, Josette, it is very hard to avoid synthetic colors. I do not think I could have made many cupcakes with this natural color though, that would take a lot of beets and time too! This cake is so cute! I’m very impressed with how vibrant you got those natural colours, I know it’s not easy! I bet his mum was happy not to have kids hyped up on artificial colourings! Thank you for the nice comment, Michelle! Yes, everyone was happy and I felt all the effort was worth it. 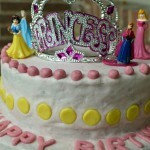 Apsara, I could see your excitement in the post and the fun you had while baking this cake…looks awesome! thank you, Divya. You missed it, but maybe next time! Looks beautiful and healthy ingredients I like it. Hi Vidya, you’re back. I missed you! thank you! Colours made from the humble kitchen is amazing and Elmo seems like enjoying it. Good job, Apsara!